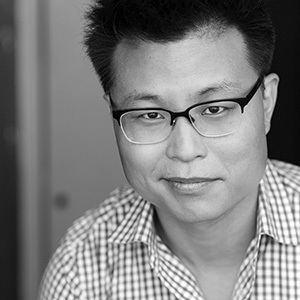 Jin is a founding ensemble member of Laugh Out Loud Theater, and has served in various capacities, including Training Center Director, LOL League Commissioner, Advisory Board Member, Kitchen Boy, and Corporate Trainer. His credits include NO APOLOGIES (Fox) and CHICAGO MED (NBC); on stage, he has appeared in Yippie Productions' Yippee Ki-Yay, Merry Christmas: a Die Hard Musical Parody, and Halcyon Theatre and A-Squared Theatre's critically-acclaimed co-production of American Hwangap. Jin currently hosts BATSU!, America's only live Japanese game show (recommended by Chris Jones of the Chicago Tribune). Jin is represented by Paonessa Talent.